This week Muslims all over the world celebrate Eid-ul Adha. They commemorate Nabi Ibrahim’s (Abraham) sacrifice in demonstrating his faith in God. Both Muslims and Christians are familiar with the story but many do not know the deeper significance of the event. Sacrifice didn’t just begin with Abraham. It goes way back. Remember when Cain and Abel sacrificed to God? (You can read about it in Genesis 4 and Surah 5:27.) One of the sacrifices was accepted by God and the other was rejected. Why? Cain offered fruits (vegetation) as sacrifice while Abel offered an animal (probably a ram or a lamb). God rejected Cain’s offering because the fruits (produce of the land) represent the labour/work of his own hands. In other words, Cain was coming to God by relying on his own works. In God’s eyes, that is insufficient. Cain’s own efforts and good deeds could not gain God’s acceptance and forgiveness. Cain’s sacrifice was rejected. Abel sacrificed an animal. When an animal is sacrificed, the animal is slain and blood is shed. And we learn that God accepted Abel’s blood sacrifice! Who did Abel learn this from? His parents, of course. Adam & Eve. This would have been a wonderful story of Abraham and his son and their faith in God, even if it ended right here. But there is more. God did something else remarkable. He provided a ram for sacrifice, as a substitute, to ransom and save the boy’s life. Why did He need to do that? God was revealing how and why Abraham’s son was saved. A sacrifice of blood was required. In Sura 37:107 it says Abraham’s son was “ransomed by a momentous sacrifice”. This ayah uses two unusual words. ‘Ransom’ and ‘Momentous Sacrifice’. Two things we can learn from this verse. 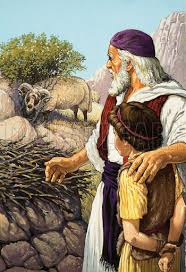 This means the ram provided by God Himself became a substitute, dying on behalf of Abraham’s son, as a ransom. Other translations of the Quran use the words: “great sacrifice”, “tremendous (noble) victim”, “magnificent slain”. Wait a minute! Who are these words describing? Abraham? His son? No. The Ram!!! The question we would then have to ask is what was so great and magnificent and tremendous about a mere animal, the ram, that it is described in such a manner! Why is the very name of God used to describe the sacrificial ram??? Because the sacrifice is a representation of something great, momentous, magnificent, that is to come, from God Himself! The whole incident was pointing to God’s plan to eventually ransom, not just Abraham and his son but the whole world, with the greatest sacrifice of all! Jesus Christ! Muslims, if you’re still reading this, I believe it’s because you are not far from the kingdom of God. Please do read on right to the end…. But why does God require and accept a sacrifice? Because God wants us to understand something…. This is the reason for the Jewish ritual of animal sacrifice that we read about in the Old Testament – for the forgiveness of sins as required by the Law of Moses. A Muslim’s annual pilgrimage to Mecca always ends with remembering the sacrifice of Ibrahim (Abraham) by sacrificing animals. If the whole pilgrimage is performed correctly including the animal sacrifice, the pilgrim’s former sins are forgiven! (Hadith Bukhari, Vol. 2, Bk 26, No 596). Compare this Islamic sacrifice ceremony and the Jewish ritual of animal sacrifice. If you look at the Jewish tradition, you will find that according to the law of Moses, the Jews had to bring an animal sacrifice for their sins. (Leviticus 1:2) They put their hands on the head of the animal as a sign of the sin being transferred from them to the sacrificial innocent animal. (Leviticus 1:4) The animal dies instead of them as a RANSOM, as a substitute in their place. These animal sacrifices had to be repeated, as it only acts as a temporary cover for former sins. A Jew has to go back to the temple every year to perform this sacrifice. In the same way, a Muslim could clear his sins in pilgrimage, but he will need to go back to perform it again to clean up his new sins accumulated after the pilgrimage. This is the significance of a blood sacrifice. But can the blood of a mere animal which is perishable redeem and ransom a human? (Hebrews 9:9, 10:1,10:3) No, it is only a temporary cover. The only blood which truly has power to take away sins is imperishable, sinless blood. If God comes in human flesh, He would have imperishable blood, which alone is sufficient to take away the sins of the world. Jesus’ sacrifice on the cross is a death He did not deserve since He did not commit any sin in His entire life. Like Adam & Eve, we all deserve death for our sins. But this punishment of death was carried by Jesus. How Can A Person Die To Save Others? According to Islam’s teachings, a martyr could intercede for 70 other people and lead them into paradise the moment his blood his spilled. The Prophet said: The intercession of a martyr will be accepted for seventy members of his family. (Sunan Abu-Dawud, Book 14, Number 2516). Also, intercession is accepted by prophets for their followers. (example see Hadith Sahih Muslim, Book 001, Number 0378). If a martyr could intercede for other people because of his sacrifice for God, why can’t the sinless Jesus Christ who was killed on the cross, also intercede for those who follow Him and put their trust in Him? Whether you agree or disagree with the requirement of sacrifice is besides the point. The issue is: this is God’s requirement. Whether you accept or reject it is your choice. But I appeal to you to learn more about this before you decide to reject it. God’s ultimate plan was to require only one final sacrifice. This is the new covenant. Jesus said that His blood represents the new covenant and is poured out for the forgiveness of sins. (Luke 22:20; Mark 14:24). God had given us a peek into this plan long ago in Abraham’s sacrifice. But many of us have not recognized it’s purpose, meaning and fulfillment. Jesus death eliminated the need for continued animal sacrifices. Only a perfect sacrifice can redeem and ransom us. Through the blood shed of Jesus Christ, anyone who follows Him and accepts His sacrifice is redeemed and reconciled with God. (Hebrews 10:19). Jesus Himself has become our intercessor (Romans 8:34) for the forgiveness of our sins and complete acceptance with God towards salvation. Jesus last words on the cross was, “It is finished.” In the original Greek i is “Tettelesttai” which literally means “Paid In Full!” This signifies that the ransom for sin was fully and finally paid! When He returned three days later, ALIVE again, He proved that sin and death and satan had been defeated because they could not keep Him dead! Jesus is alive today and still offers forgiveness and salvation to whoever is willing to repent of their sins and follow Him, mot by doing good deeds but by accepting what He has already done for us!